One might think of our approach as a “multiscale molecular microscope”. 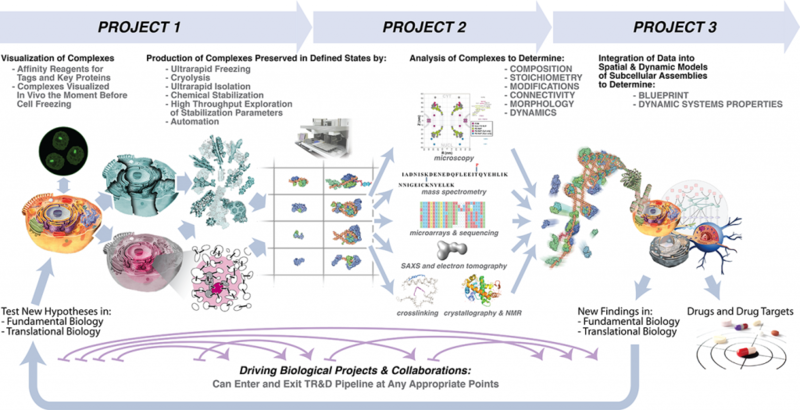 In this analogy, project 1 prepares the samples for observation; project 2 enables detailed observation and analysis of the sample; and project 3 enables integration of the data into a dynamic and interpretable picture of the sample. Though not a single machine, the pipeline can produce a dynamic picture of macromolecular interactions at atomic level, allowing us to delve into the details of protein-protein interactions, enabling us to move around cells, tissues or organisms, rapidly generating data to interpret and image. Our pipeline is versatile, and is designed to be open, so that any investigator can enter and exit at any point, as they see fit. Develops technologies that will purify and preserve, with high fidelity, various defined complexes in the cell. We address issues of signal-to-noise and preserve the isolated complexes in their native states, including low abundant components and highly dynamic interactors, both of which are usually missed. Provides comprehensive, quantitative, and detailed spatial and temporal sampling of dynamic complexes. We focus on issues of specificity and comprehensiveness – current datasets are riddled with both false positives and false negatives confounding interpretation. Develops computational tools to integrate our diverse data into static and dynamic models of macromolecular structures as well as molecular networks representing cellular processes. We address issues of interpretation, integrating multiple data-types into dynamic and structural models to reveal complex molecular structures and mechanisms.